This week, we did some geocaching ourselves and went in search of the Sandlin Memorial Park cache, which is on a rural road in Old Fort. 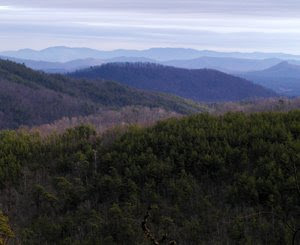 We don’t know much about the Sandlin family; a Google search showed that George was born in Old Fort in 1877 and married Lula in 1913, and that Lula lived to be 100 years old. The park looks like a great spot for eating lunch by a babbling brook (which, when we were there, had turned into a very active creek after a day’s rain). 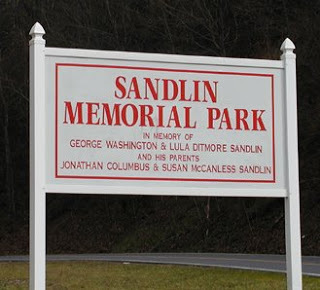 Sandlin Memorial Park sits in a little valley below the road and has a few picnic tables, and also a lot of green space bordered by the creek, perfect for taking dogs to play. 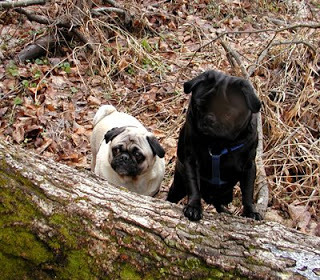 The innpugs thoroughly enjoyed running around with Dave while Brigette searched for the cache. 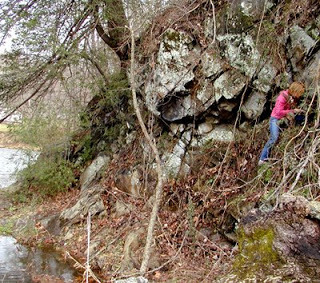 The cache itself wasn’t hard to get to but involved a little bit of rock climbing. Brigette, of course, was up to the challenge. This was one of our quickest finds to date, but part of the reason was that we were in a hurry to get out of the rain. Two of our geocaching guests, Jeff and Dawn, shared some very creative ideas about what kinds of caches to hide and where. Hopefully, we’ll be hiding another cache very soon. They’re almost as much fun to hide as they are to find. This entry was posted in Uncategorized and tagged geocaching, innkeepers and innpugs, Old Fort / Andrews Geyser, Winter by Inn on Mill Creek. Bookmark the permalink.